← Why do we have seasons? How to get from a ‘problematic situation’ to a ‘systemic intervention’? While reading ‘15 praktijkverhalen over kennismanagement‘ [Dutch for ’15 practical cases of knowledge management’] I came across one story (about Kennisland, Dutch for ‘knowledgeland’) which triggered my curiosity. 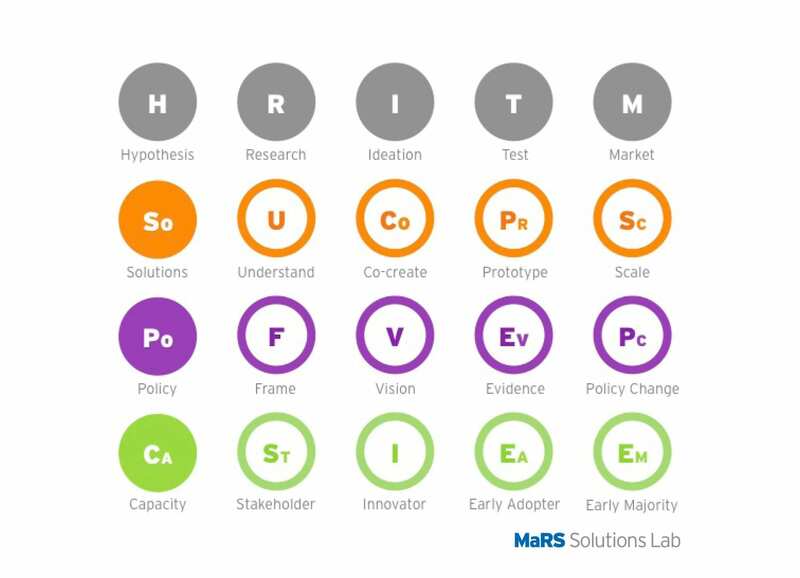 It led me to MaRS (originally ‘Medical and Related Sciences’, but now an acronym no more), which is a partner in a Canadian innovation network (Launchlab) that provides knowledge services to ‘help entrepreneurs launch and grow the innovative companies that are building our future.’ On one page it is written that MaRS blends “together design and systems thinking. The “Periodic Table for Systems Change” is our process and strategy to address complex societal challenges.” I liked the format of the table and will use it below to explain what the systems approach is about. 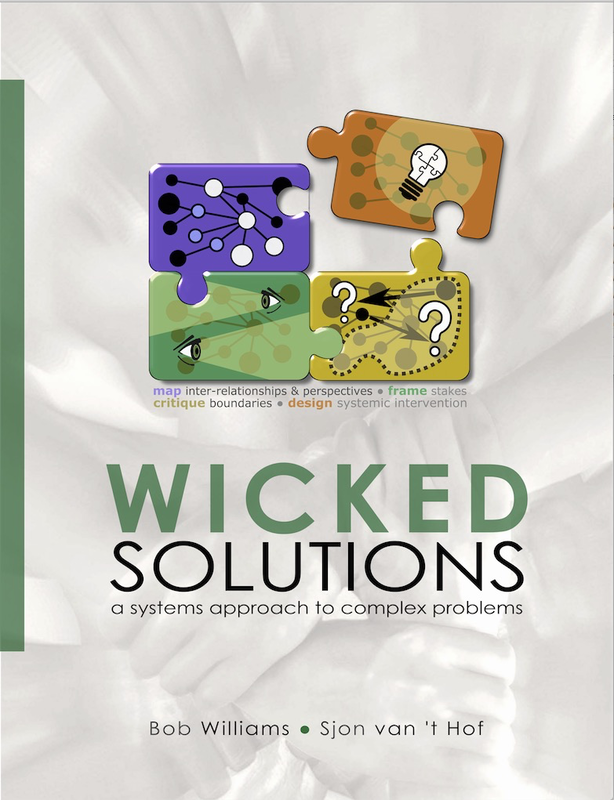 Wicked Solutions Pathway Wicked Solutions is the title of a book (in print or as PDF) on a systems approach that is based on the systems approach invented by C. West Churchman. The systems approach is a generic methodology to address wicked problems using a number of principles. 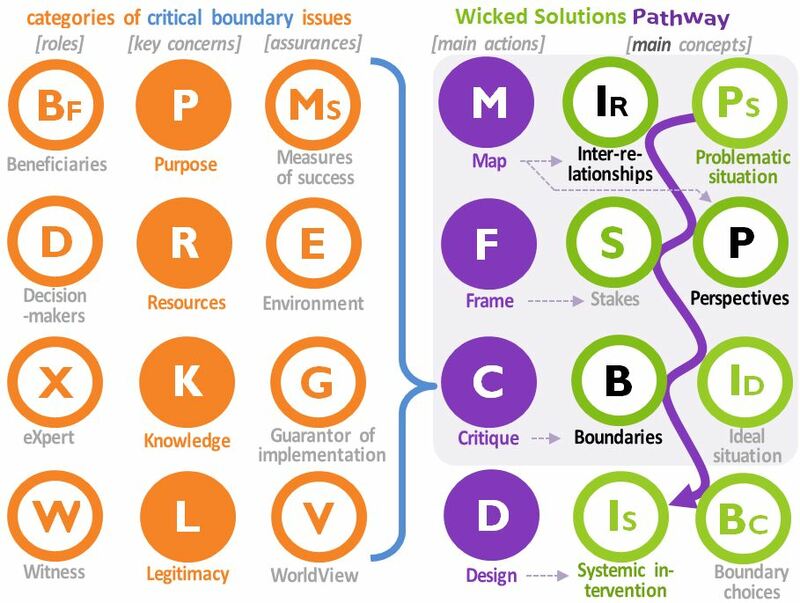 To operationalize these principles, Wicked Solutions proposes a pathway of 8 main steps (the 8 green ‘elements’ on the right) to guide a user in a systematic process from identifying a problematic situation (or wicked problem) to designing a systemic intervention. Perhaps this pathway bears some resemblance to John Bunyan´s winding, stringent, heart-searching and narrow way. It is represented by the wavy, purple arrow in the periodic table. Three key systems concepts form the anchor points for navigating the narrow, winding way. A concept map of the table of elements can be found here. Main concepts and actions There are 3 key systems concepts and 4 main actions to get to a systemic intervention. The 3 systems concepts are: inter-relationships, perspectives and boundaries. Inter-relationships give systems their unity, while perspectives provide contrasting or conflicting views on them, which leads to contested system boundaries, the critique of which may result in illumination (incidentally the foundation of progress, aspiration, innovation and democracy). When we talk about systems we could also call them human problem situations. The 4 main actions are (in the purple circles): (1) to map the inter-relationships and perspectives (e.g. in a so-called rich picture; this is also called ‘sweeping in’, since it expands the scope of the situation); (2) to frame stakes (stakes are closely linked to people’s perspectives; they are what makes it difficult to find a common solution; framing stakes here means that stakes are framed in a such a broad way that hindrances to their resolution can be overcome; this happens in the next steps); (3) critique (i.e. debate critically) the system boundaries by taking into account the various perspectives; this results in a large number of possible boundary choices; and (4) design a systemic intervention by making the best possible combination of boundary choices. The critical heuristic In order for you to carry out the boundary critique logically and systematically, use is made of a so-called critical heuristic, which consists of twelve categories of critical boundary issues in a 3 x 4 grid. The four key concerns are in the middle vertical: an intervention needs a purpose, resources to fulfil the purpose, knowledge to know what resources are needed, and legitimacy to make sure that the system doesn’t have negative effects. The heuristic also has a horizontal logic: ideally the purpose serves the stated beneficiaries and the measures of success (‘indicators’) should be able to indicate whether it does or not. Similarly, the decision-makers are in control of the resources and need to make sure the environmental factors (not in control!) are in place to make sure that the resources are adequate to serve the purpose. These categories of critical boundary issues are natural categories. By making them explicit one can make a conscious effort to answering them and find out elements of possible solution (boundary choices) in the process, which is what the boundary critique is about. The critique may also called ‘the unfolding’, since it unfolds what has been swept in earlier. The guarantor and worldview The idea that knowledge for an intervention design comes from an expert makes perfect sense (but also begs the question: “who is and who ought to be the expert?”). It may not be directly evident what is a ‘guarantor’. In this case the guarantor is who (or what) is able to guarantee that the knowledge of the expert is right and that implementation will take place correctly, where one is free to take the long-term view of sustainability and effectiveness. Similarly, in the case of legitimacy we need a person whose role it is to ensure that the intervention is perfectly legitimate and nobody is harmed by it or if there is that such a person is properly compensated. But if this is not the case, one might ask what worldview is entertained by the expert of decision-maker that they come up with interventions that have serious negative effects. The next question would be how this worldview can be improved so that legitimacy issues no longer occur. balancing system: in the first place it is possible to dampen hopes a bit when formulating the ideal situation. In fact, this will happen more or less automatically while framing the stakes, since the frames are in the form of general, ‘common denominators’. Secondly, there is additional scope for balancing during the boundary critique, by finding a common ground when debating the boundary choices. And finally, there are possibilities for combining the feasible and the desirable when making the final intervention design. So, plenty of scope for ‘negotiating’ without losing sight of the fundamental systemic nature of human problem situations! For more info, also see my overview of posts on the systems approach. *It now occurs to me that Good-Will at the Wicket-Gate in Bunyan’s allegory may well have some parallels in the systems approach – of ‘ wicket’ problems – and some of its roots that can be traced back to Immanuel Kant.